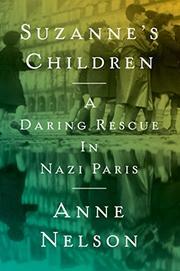 Resurrected from obscurity, the life of a remarkable Brussels-born woman who used her prominent status in Nazi-occupied Paris to shelter orphaned Jewish children. In a dogged work of research, Nelson (Red Orchestra: The Story of the Berlin Underground and the Circle of Friends Who Resisted Hitler, 2009, etc. ), a playwright journalist who teaches at the Columbia School of International and Public Affairs, illuminates the brave and tragically short life of Suzanne Spaak, nee Lorge, whose dangerous work hiding and finding shelter for Jewish orphans during the war in Paris brought imprisonment and death in 1944. As the daughter of one of Belgium’s leading financiers, Spaak was in the right place when the Germans invaded in June 1940. Inhabiting a beautiful apartment in the Palais Royal full of artwork by the family’s protégé painter Renée Magritte, the Spaaks, though unofficially separated (her husband was living with another woman), were in a unique position to aid the Solidarité network, which provided aid to Jews being rounded up, arrested, and deported to concentration camps. It was Suzanne, however, who took her work helping with forged documents to a new and dangerous level, co-founding an organization called the National Movement Against Racism in 1941. Working with various churches, she and her colleagues knocked on doors to spread the word about the roundups, soliciting money from her rich friends and even her famous neighbor, Colette. In the many Paris orphanages, Jewish children were in constant danger of being rounded up, and Spaak did the underground work of creating papers for them and secreting them out to homes in the countryside. Spaak’s story is all the more poignant because of the role her own husband played in obscuring her legacy after the war, and Nelson does a valiant job of bringing together the complex threads of this story. A page-turning account of the courageous actions of a woman recognized in 1985 by Yad Vashem as Righteous Among the Nations.